What IR filter is best to image planets? 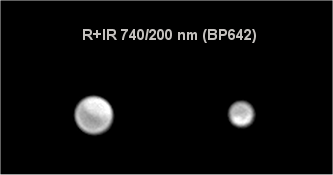 You are at:Home»Setting the equipment»Which IR filter is best to image planets? There are many IR-pass filters on the market. Here is a short guide to help you pick one… or several of them! 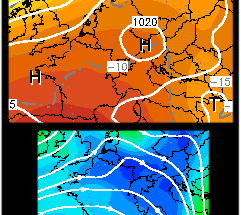 It often gives a better seeing than in visible light, as IR is less affected by our atmosphere than RGB for example. So needless to say you have to own one! However its optical resolution is less good than visible light (read: The resolution and the wavelength). It has an interesting penetrating power of planetary atmospheres and so gives access to details found deeper than those accessible to a color image. Mars in 2005, with two IR filters I don’t own anymore but today’s equivalent would be the Baader 685 and Astronomik 807. The image taken at 780 nm is less resolved. Having the possibility of choosing between various IR filters will allow you to finely adjust the best one when seeing is not good, because turbulence is less and less important when you go deeper into infrared. Last summer on Saturn during mediocre nights, I used to switch every R+IR and IR filters I have until I get that one that gave the best compromise between my capacity to focus the camera and the awaited level of resolution. From that point of view, from a telescope diameter of 250 mm at least, it will be interesting to have at hand a second IR-pass filter of a deeper cuton wavelength, such as one of the two Astronomik, or the ZWO 850 (I don’t own that last one). Planets do not react the same way to the IR filter and you must know what’s the most interesting for each of them. Jupiter is best imaged with a large-range IR filter. The Baader 685 or Astronomik 742 (from 300 mm or 12″) will be perfect to enhance the small atmospheric structures, since these filters eliminate higher levels of tenuous gaz that tend to lower their contrast. A R+IR filter is also an excellent choice, that will simply deliver a slightly lower level of contrast (although still good! ), but with a potential higher level of resolution. 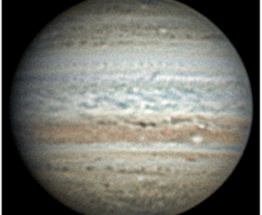 Jupiter with Baader RG610 (R+IR) and Astronomik 742 (IR) and a 250 mm telescope. Contrast is higher in IR but the resolution sligthly better in R+IR. Saturn is a more complexe target. 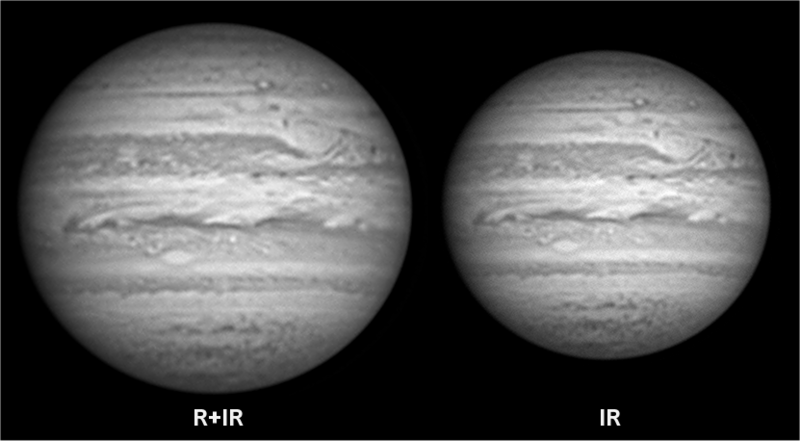 The penetrating effect of IR plays a role as it does for Jupiter, but the accessible details are much smaller and less contrasted. 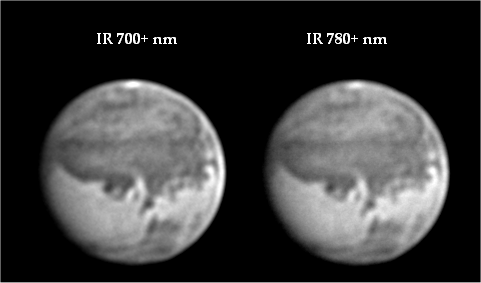 R+IR filters will be prefered for that planet to get a better resolution, but if an instrument powerful enough is used (at least 300 mm), it will be possible to benefit from a more steady image thanks to IR filters from 700 to 750 nm. Above, Saturn with Astronomik BP642, IR807,and Baader IR685. Image is crisper with the R+IR filter, contrast is increasing in IR, however the details vary in a more complex way than on Jupiter. Images taken with a 305 mm Newtonian. Using an IR filter on Mars let only the surface visible (except when a dust storm is active). As a result, details remain the same whatever wavelength you may choose. There is no interest to use a deeper IR filter on this planet as it would result only in a loss of resolution (unless you try to image in poor seeing). This potential effect is easily visible on this planet that most of the time presents a modest apparent diameter (see illustration above). Being very small and very dark objects, Uranus and Neptune will largely benefit from an R+IR filter better than a “pure” IR, in order to gather as many light as possible without losing too much optical resolution. Owners of big diameters (at least 300 to 350 mm) can however consider using the Baader IR685 that will offer a higher contrast on the scarce details visible. “Longer” IR-pass filters are of no interest there. Beneath are two images of Uranus and Neptune taken with Astronomik BP642 and a 305 mm Newtonian. Venus is the only planet where a deep IR filter should be prefered. Accessible IR details on that planet are of very low contrast and will be better revealed by anyone of the following filters: Astronomik 742, 807, or ZWO 850. 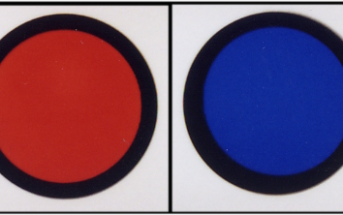 The choice will be made to fit the resolving power of the instrument (Astronomik 742 before 300 mm, Astronomik 807 or ZWO 850 for bigger telescopes). This is as well the only planet where a valuable use will be made of the 1-micron IR-pass filter, to catch the thermal signal of the surface! 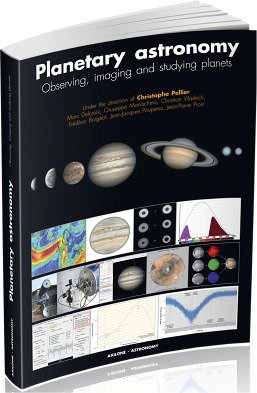 For a deeper investigation, the coming book Planetary Astronomy contains a full chapter entirely dedicated to planetary filters, that will describe in depth all you must know to use them!